The dining denizens of Melbourne developed a taste for chef Heston Blumenthal’s signature blend of culinary magic when he moved his UK-based restaurant, The Fat Duck to the city’s Crown Towers hotel for six months while its Bray headquarters were updated. Now, the celebrity chef is back with an iteration of Dinner by Heston Blumenthal, his first permanent set-up outside the UK. Once again located in Crown Towers, the space has been refitted by local architecture practice Bates Smart who, have created a suitably theatrical interior to match the chef’s imaginative menu. Upon arrival, a dim corridor wafting out aromas of damp moss, leather and wood smoke, leads to a door that dramatically slides open to reveal the restaurant, where angled floor-to-ceiling windows frame views of the Yarra River. A charcoal background with bold lime green and orange hues, form a rich colour palette inspired by two enlarged photographs - by artist Romas Foord – from the book, Historic Heston. Much like its London sister of the same name, the menu here focuses on Blumenthal’s trademark intricately researched dishes inspired by the fanciful platters of the Royal courts of King Henry the VIII, but with an Australian twist, using local ingredients such as kangaroo. 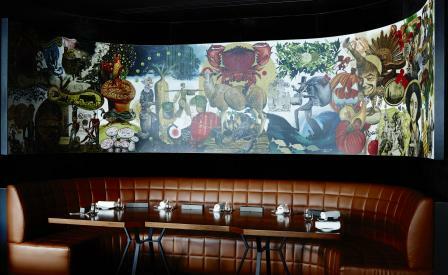 The hottest seat in the house is the chef’s table, located in the kitchen below a mural by artist Dave McKean, where six guests can watch the action while sampling dishes such as Savoury Porridge – grilled abalone with garlic and parsley butter, pickled beetroot and fennel – from the tasting menu.